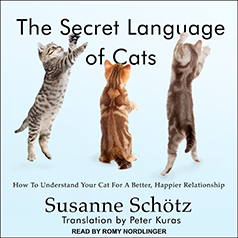 In The Secret Language of Cats, Susanne Schötz offers a crash course in the phonetic study of cat sounds. She introduces us to the full range of feline vocalizations and explains what they can mean in different situations, and she gives practical tips to help us understand our cats better. You can’t view any supplemental PDF materials before you buy The Secret Language of Cats. If you purchased it elsewhere, please enter the access code provided in the beginning of the audio to view the supplemental material. All access codes should be entered in lowercase letters. PDF software is required to view the supplemental PDF.